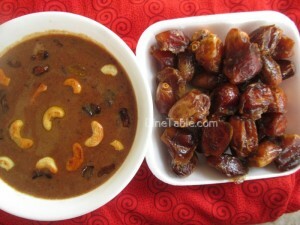 Dates payasam is A..K.A ‘eenthappazham payasam’ or ‘eethappazham payasam’ in Malayalam language. Usually payasam is served during special occasions like birthday parties, wedding parties, and festivals like Onam, Christmas, Eid etc. Using dates, can make as pickle, juice, cake, fritters etc. This dessert is very easy to prepare with easily available ingredients. Consuming dates is good for the health. It is an excellent source of vitamins, proteins, calcium, minerals and overall well being for the growth and development. Try this yummy payasam and enjoy the taste! Soak dates in 1/2 cup warm water for 15 minutes, set aside. Heat ghee in a pan add cashew nuts and raisins and fry till crispy, set aside. Transfer the soaked dates to a mixer add little water used for soaking and grind to a semi fine paste. Boil the jaggery in a little water and strain to free of impurities. Then add dissolved jaggery and mix well and cook for 5 minutes in low flame. Then add thick coconut and cardamom powder mix well and cook for 2 minutes. Then add the roasted nuts and raisins. Tasty Dates payasam is ready.